A family owned / operated Woodworking Supply store. Our warehouse is packed with Domestic & Exotic woods, SLABS, Turning & Carving woods, Tools & Finishes. Woodworker Network offers unique domestic and exotic, hardwood and softwood, furniture grade lumber for the woodworker at affordable prices. Woodworker Network produces unique slabs and turning woods ready for use. We also supply woodworking tools, router bits, abrasives, blades and finishes at very competitive prices. Our mission is to provide the woodworker with quality, affordable lumber and woodworking supplies. And now I know about your great blog and store. I’m very interested in woodworking. About five years ago I had a designer/expert woodworker make me one of his signature pieces–a gorgeous dining table from bubinga and mahogany. Thank you for stopping by Robin. 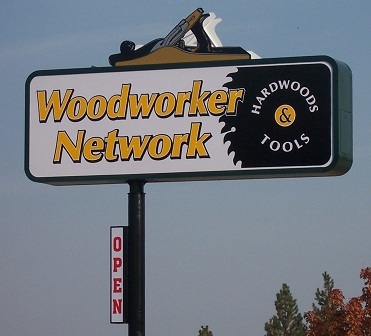 We look forward to your posts and advancements in woodworking as well and be sure to check out our website at woodworkernetwork.com for all your wordworking needs… tools, materials, we have it all. Thanks again and we will see ya round!